Description Of Item: Unleashed Star Wars figures are back, and they're smaller than ever! 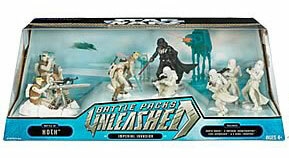 With the Star Wars Unleashed Battle Packs, Hasbro provides an army in every box. Each set of four action figures is themed to a specific army, battle, or planet, and they're ready to do combat on your desk at work, your collector shelves, or in your back yard.